You may have been born with baby-soft skin however, years of sun exposure and neglect can take its toll on your complexion. Rough skin and an uneven skin tone are some of the most common side effects of skin damage caused by environmental factors or the natural aging process. If you’re tired of looking in the mirror and seeing dry, dull skin, you may need to rethink your skin care routine. But if you’re looking for a treatment intervention, check out these top five procedures that can treat uneven skin tone and rough skin texture. Chemical peels have been used for centuries and in countries all over the world. They remain one of the most popular skin treatments today due to their safe results and effectiveness. It is effective in treating acne scars, age spots, freckles, large facial pores, and pigmentation. 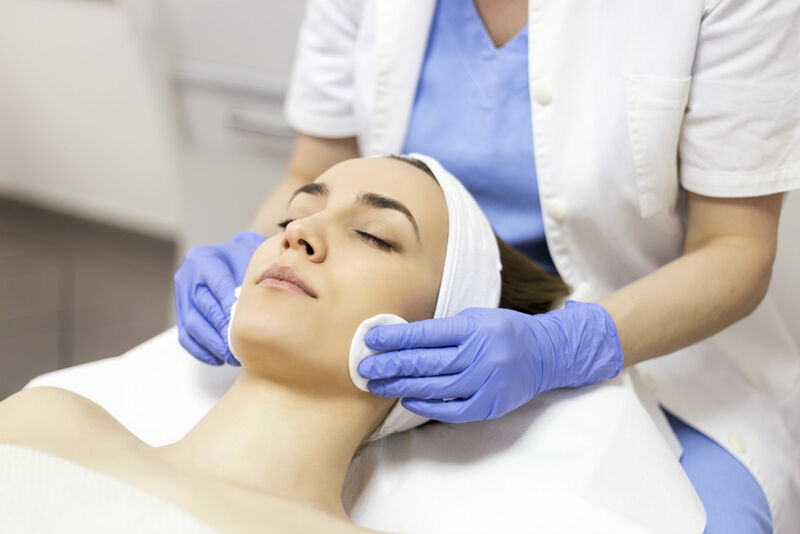 Chemical peels work by applying safe chemical solution on top of the skin. This causes the skin to peel off which also prompts the rebuilding of collagen. When the peeling is completed, which can last at least five to seven days, the new skin is smoother and clearer. At Cutis Laser Clinics in Singapore, we offer two types of professional chemical peels: Anti-Acne Peel and Crystal Peel. Anti-Acne Peel is formulated with Salicylic Acid to reduce acne by unclogging the pores and killing the acne-causing bacteria. Whereas Crystal Peel is formulated with lightening ingredients such as Glycolic, Hydroquinone, Kojic to lighten freckles, age spots, pregnancy marks, uneven skin tone and other discoloration. The VI Peel is another type of chemical peel that is specially formulated to rejuvenate aging skin and help prevent future damage. It helps to reduce age spots, hyperpigmentation, wrinkles, and freckles. It can also smooth away rough complexion and uneven skin textures. The VI Peel also stimulates the production of new collagen for skin that is naturally firmer and more youthful. Following the application of the chemical peel solution, the skin may appear red or tan for a brief time but this can be concealed with mineral make-up. The actual peeling process begins three days later and can continue for at least five to seven days. You can expect to see results in as little as a week after the peeling subsides. Quick tip: After a chemical peel treatment, the skin is temporarily more sensitive to the sun. It is recommed to wear a sunscreen with “broad-spectrum” – protection against the sun’s UVA and UVB rays. Dermapen is a safe and rejuvenating treatment for the skin that uses an advanced automated skin needling device. The procedure is designed to improve the appearance of fine lines and wrinkles and promotes skin tightening. It is also highly-effective at treating hard-to-reach areas of the skin, such as around the eyes, lips, and nose. Dermapen works by using tiny, shallow needles to puncture your outer layer of skin to create a controlled skin injury. This injury causes your skin to begin the healing process by producing new collagen and elastin. This results to an overall improvement of texture and tightness of the skin reducing wrinkles, scars and even stretch marks. This uneven skin tone treatment is effective on all skin tones and textures, as well as all skin types. The Cutera Pearl combines the impact of resurfacing lasers with the gentleness and safety of non-invasive procedures to treat aging and sun-damaged skin. It reduces wrinkles, rough and uneven skin texture as well as pigmentation resulting to a healthy, pearl-like glow. Pearl works by treating the top most layer of the skin with pulses of light in a pre-selected pattern. The laser sends heat to the deeper layers of the skin which triggers the body’s healing process. A natural protective dressing forms on the skin to minimize downtime. After three to five days, this natural dressing will peel off revealing a healthy and new skin underneath. To improve your skin’s healing and give better results, these procedures can also be combined with the Laser Genesis procedure, an FDA approved laser treatment without downtime. Laser Genesis is proven to reduce the skin’s inflammation and helps heal potential scarring from acne. This treatment also reduces pores size and works to improve the texture of your skin by stimulating collagen growth with repeated treatments. The procedure is comfortable as you will feel a gentle warming of your skin’s surface as the laser handpiece is moved back and forth about ½ inch above your skin. You can also return to your normal activities after the treatment. But remember to wear your sunscreen if you may need to do any outdoor activities. Nowadays, having clearer, healthier and smoother skin is more achievable than before. With treatments such chemical peels, Dermapen and Pearl, reducing variety of skin issues, from rough skin texture, fine lines and wrinkles to enlarged pores and discoloration can now be safely and effectively addressed. While the treatment can improve skin tone and rough skin, know that your skin may still revert with age. Undergoing these treatments on a regular basis can help you maintain good results. For more information about any of the treatments mentioned or to schedule an appointment with our Harvard-trained aesthetic doctor, Dr. Sylvia Ramirez, contact Cutis Laser Clinics in Singapore today.